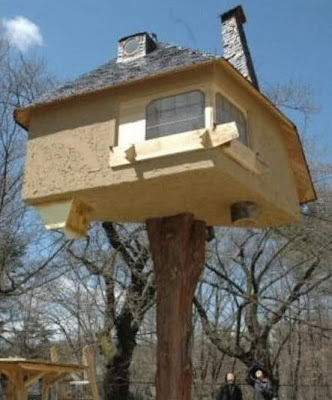 Been working on my own treehouse/treehouses lately (lots of climbing!- 35 feet in the air! ), and one of the models will be trekking down to Baltimore, MD April 29-May 1st for the Transmodern Festival- aka "Camp Camp" to which Relaxshacks.com has been invited. We're shooting SEVERAL episodes of "Tiny Yellow House" TV down there as well (from treehouses to trailer/tumbleweed-style homes (possibly the Elizabeth Turnbull mobile house/dwelling near Yale University in New Haven. CT)) and are in definite need of backers and donations. Any donation of $30 or above, and we'll mail you a t-shirt (Purerockfury- my old clothing line/site), a cd compilation (including my band) AND add your name in the thank you credits of one of the episodes. ANY donations are welcome though- and we'll thank you in the vid as well...if you run a business too- we're episode lead logo/text/voice over ads too- email me. All donations can be made (and would be greatly appreciated) to the paypal id: senorsell@hotmail.com (be sure to mention your shirt shirt- US shipping only). Also- anyone in the Baltimore area- to help cover the enormous costs of a 3-episode shoot, we're also considering building a mini-shelter for an episode of MAKE MAGAZINE (that could serve as a micro-greenhouse/coldframe, a tiny backyard office or reading spot, guest sleeper, or a treehouse/fort for kids)- and then selling it (to help us get our asses back to Boston in one financial piece). Anyone REAL close to Baltimore, who might be interested in this 4' by 8' shelter (like the "gottagiddaway hut- but twice as big)- contact me at kid cedar at gmail dot com. $800- and delivered within 30 minutes of the city (or anywhere north on the way back to MA- if its right en route). I wondering if that chinmey is actually stone?- and functioning too?....meaning there would be an enormously heavy woodstove or fireplace inside.